I am continuing my quest, as one of many others, for getting better oven spring and open crumb. This is my adaptation of Trevor’s European Peasant Bread. Mill spelt and rye and sift out the bran to feed the levain (as per Dab). Sift out the bran from the whole wheat flour. As an aside, I am surprised that I sift out much more bran out of the commercial flour than out of my own home milled. Weigh the bran and set aside. Mine ended up weighing 35 g. Reserve the sifted flour in a large bucket or bowl. Weigh out the unbleached flour and remove enough from this amount to add to the bran in order to equal 140 g. In this case, I removed 105 g and set it aside for the levain. The rest of the flour joined the sifted flours in the bucket. After refreshing my starter 2 or 3 times, I build the levain in 3 stages: Stage 1 - 10 g starter, 20 g water, 20 g bran. Stage 2 - 40 g water, 15 g bran/25 g flour. Stage 3 - 80 g water, 80 g flour. Each stage took about 8 hours except for the last one that I used after 6 hours. Once again, the first build with only bran in it, had no rise but the levain rose just fine once unbleached flour was added in. Autolyse the mix of flours, the ground flax and the water for about 4 hours. Add in the pink salt, the kefir and the levain and mix well. Use folds and in bucket kneading to make sure that everything is well integrated. Let rest for a few minutes and do another set of folds. Fermentation was 3 sets of folds 30 minutes to 45 minutes apart and one last fold an hour later. Bulk fermentation took 4 and half hours and the dough rose about 30%. This is where I began to doubt myself. I had lots of bubbles on the edges right from the beginning but there didn’t seem to be a lot of large bubbles through the wall of the container. I traditionally have waited until the dough doubles but that was before doing folds right through the bulk. The last few weeks, doing folds through the bulk, I still waited till the dough had risen almost to 50%. My dough is usually like a bowl of jello. Stopping the bulk earlier gave me a dough with air in it but not what I am used to so I almost put it back in the bucket. I went back and checked out Trevor’s videos and mine was still poofier than his so I decided to just forge ahead. Lightly flour the counter. Now that was a change for me as well. I normally use lots and lots of flour for shaping. I am trying to cut back on this habit. Do a very light fold and remove the dough gently from the bucket. Divide the dough into 3 equal portions. Preround the dough with a scraper. Trevor, if you are reading this, I have to say I hate you for making it look so easy. Imagine trying to round 6 boules on a counter that is 24 by 30 or so and part of that counter has a built in trash container. Oh and I forgot, the scale has to have a spot too on here. Well the dough was sticking to the scraper, to me, and to the counter! I tried to be twinkle finger like Mr. Trevor but I am sure he would be killing himself laughing at my ineptitude. Well long story short, I did get them somewhat rounded. Nothing like those nice little boules he gets but at least, they weren’t pancakes AND I didn’t deflate the dough. Let rest for 20 minutes and then do the final shape. I did Trevor’s cinching method which is something I hadn’t tried before. I usually end up degassing the dough quite a bit. This time, there was no degassing whatsoever except for the part where you roll over and pinch the dough gently to hold it. Check out Trevor’s videos on cinching on Instagram. That seemed to go a lot better for me than the rounding. I plopped the boules into the bannetons seam side down even though they were not perfectly round. I figured it was better to preserve the air in the dough than worry about perfectly shaped boules. Then cover and put to bed in the fridge for the night. The next morning, the dough had risen a bit but had flattened out somewhat. I was sure that I was in for some flat, flat, flat loaves. Heat the oven to 475F with the dutch ovens inside for at least 45 minutes. Place rounds of parchment paper in the bottom of the pots and gently place the dough seam side up inside. My feeling of getting flat, flat, flat loaves was reinforced when I turned out the dough and picked it up to put into the pots. It was definitely not firm like I am used to. It was soft enough to bend in the middle when I picked it up by the edges. So it was a quick movement from the counter to into the pots. I resigned myself to 12 flat, flat, flat loaves. Did I say that they were going to be flat? Cover the pots and bake the loaves at 450 F for 25 minutes, remove the lids…. and surprise!!!!! I got great oven spring, great ears and just awesome loaves! Wow, who would have guessed that! I dropped the temperature to 425F and baked for another 22 minutes. Cool, admire, do a happy dance, decide that Trevor knows what he is talking about and enjoy! 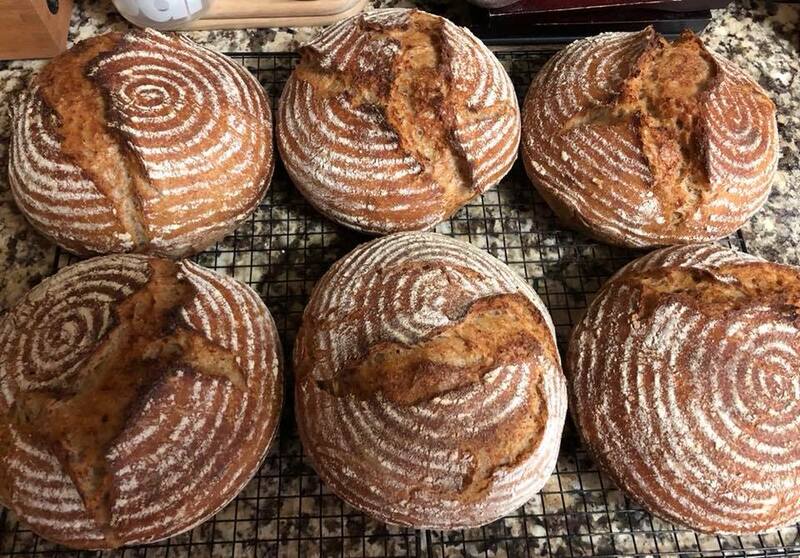 As a side note, the second batch of 6 loaves (I make 12 total for those who don’t know and one batch makes 3 loaves), the bulk ended up much closer to a 50% rise by the time I got to it. I remembered reading that if you get closer to 50%, do not do a fold to remove the dough. Just remove it as gently as possible, with a scraper in order to not deflate it. The second batch turned out just as well as the first. I am very curious to see what the crumb looks like but the loaves are still hot. 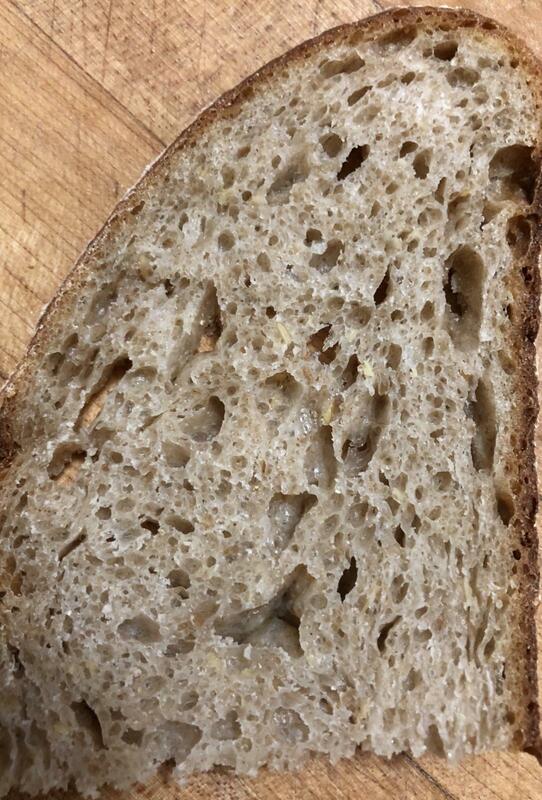 Crumb shot to come later. And you can churn out many lovely loaves by the dozen. All of them perfect! I once tried the European peasant bread but it's been a while. You've tempted me for another visit. is that if one bombs, they all bomb! And since they are usually spoken for, it can be a bit risky. Wow, gorgeous. Could I feature this on the homepage for a bit? Question: can you explain what/why with using bran to feed your starter per something Dab said? I don't know what that's about and I'm curious.. thanks! that the bran in whole grain flour cuts the gluten strands and impedes rise. 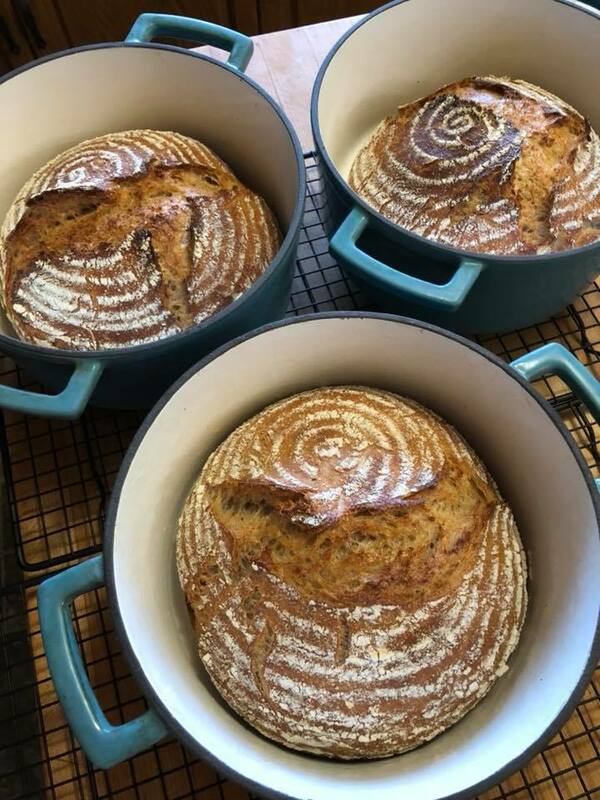 So what he does and has told me countless times, is to sift the bran out of whole grain flour and put it in the Levain so that the acids can work on softening it. Of course, there isn’t enough bran sifted out to do all the builds, and you have to use some flour to make up the total amount needed, but the longer the bran is in the Levain, the better chance it will soften. I have been resistant to this process because of the extra work and calculations involved. I finally decided to bite the bullet and just do it. So instead of prepping my flour Friday night, I now do it Thursday so I can sift out that bran, figure out how much I got and how much unbleached flour I am going to need from the dough recipe to do my builds. I store the bran and the extra flour in plastic containers ready to go in the levain for the next morning. The sifted flour goes into my cambro bucket and I weigh out the remaining unbleached flour and ground flax seed. If there are any other things that can be prepared at that time, I do it. So often all I have to do on Friday is the Levain builds. Something that really surprises me is that I can sift out way more bran out of the flour you gave me (Arva) than the flour I mill myself. I do use as fine a setting as I can but I would have thought that milling flour commercially would result in a finer product. Oh and I simply sift through a kitchen strainer. That's definately a lot of work! It's what I was looking to understand. But I'm thinking of all the things I could improve upon to get a better rise, I'm not sure softening the bran is going to move the needle as much as improving my shaping technique - as I've been learning from employing the advice Trevor gives in his book. My rise has definitely improved since reading and incorporating his comments into my method. But hats off for your gumption and great industry in doing this! That sure is a lot more work and makes your loaves even more impressive!! I think you are right about the shaping technique making a huge difference. 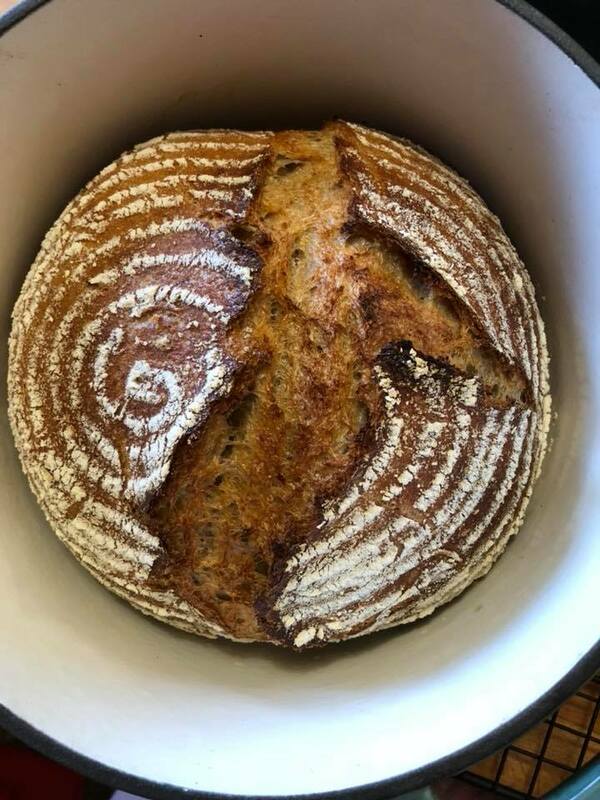 I previously shaped my boules by going all around the dough and pulled the edges into the centre, then I flipped it over and pulled it towards me until I had a really tight boule. Well, what that did was deflate the dough by quite a bit. The rounding pre-shape and the cinching allows the dough to get that surface tension with knocking any of the gas out of the dough. Looking forward to your future bakes. make the bread more sour? I don’t want sour bread so have held back from trying this step. I get what you mean about the bran effect on the gluten, but what impact does it have on flavour? so I definitely don’t aim for that. I do my builds at about 82F (oven with lights in and door cracked open) and about 8 hours apart except for the last one when I use the Levain as soon as possible. If it’s ready before I am, I put it in the fridge and it still doesn’t produce sour bread. It might be the characteristics of my starter though. I refresh the main starter in the fridge every few weeks and I also take a bit and do some 1:1:1 feeds 12 hours apart with discarding half each time to get my starter nice and lively before doing the builds. I think all of this helps keeping the sour down. Next time I plan a bake I will try this. Bake prep already underway today so maybe in a week or so I will try. sign me up. Of course I'd have to learn to use a hoe, scythe and adz along the way. But as long as I can bring my toothpaste and brush, count me in! They look your typical wonderful (and you kept the ingredients list well within my "tolerance"). I especially like the Batch #1 & 2 pictures, which for some reason, remind me of dominoes. You are in full swing mode for a long time already! Oh, and congrats on getting marquee prominence. Congrats on the front page! It's great to see all of your experimenting is paying off. If you want to end up with more sifted out bran, you will need to use at least a #40 sieve which will get you a finer flour. I personally hate sifting the flour and I vow to make a home version of an electric flour sifter. They sell one for the Komo Mill but I don't have that one and I'm hoping maybe Wolfgang will make one for the Mockmill at some point. I actually have a #50 sieve also, but that is so fine it's crazy to even attempt to use it and I have almost no patience at this point in life :) . They sell a sifter for the Komo mill? inside and out. Beautiful color loom and spring on the outside and a nice open cumb of various hole sizes of irregular shapes with none too large. I have a hunch that the taste is the best part though. Your sieve is a bit too large. You should get about 12% extraction for the bran since grains have 11-13% bran in them. You are getting about a 7.8% extraction so a bit less than half the bran is slipping through. I assume you are not tempering your whole grains before milling them like a professional miller would do. Tempering allows for larger pieces of bran to be broken off when milling which allows more of it to caught in the sieve. I do not temper either because it is just another step and my cheapo sieve just happens to sift out 12% extraction after I adjusted my mill to not be on the finest setting so you might try that. Otherwise I would do three different things with the levain build. I would first get the starter amount up to 15 g from 10g. Then get all the bran into the first feeding of the levain all 35g so it is in the acid the max amount of time and go to a 2 stage levain build with the first stage being 4 hours and the 2nd stage 8 hours. Then I would use the high extraction flour from the whole graine for the 2nd stage of the levain rather than the unbleached white flour. 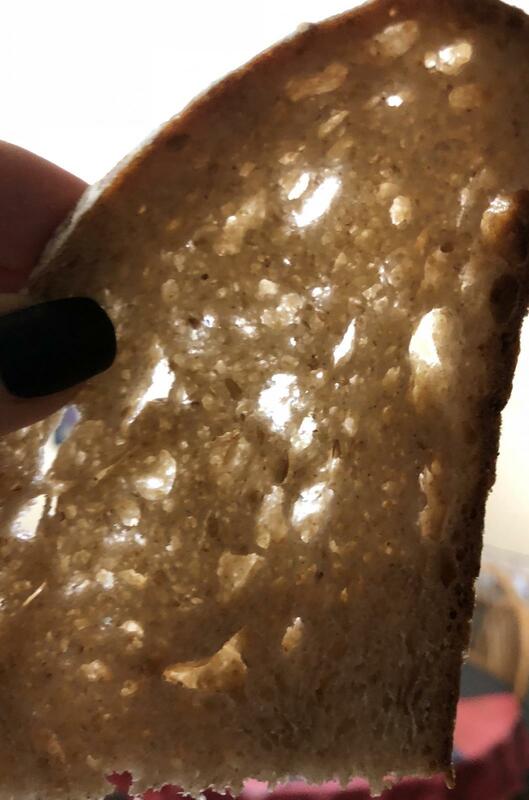 With such great bread as this is, it is hard to think that the crumb can even be better but I bet it can with such a fine baker as yourself! You are getting there very quickly. Well done and happy baking Danni - Nice front page too! Will do for the next bake! I am using a metal kitchen strainer/sieve so I am not surprised that I am not getting as much bran out as I should. I always thought that milling the flour at a finer setting made for better bread. I definitely can dial the setting to more coarse flour. This whole sifting thing will be a lot easier whenever I receive the Komo sifter. In the meantime, I’ll just keep using my trusty kitchen sieve. Oh and no, I don’t temper my grains. I didn’t even know that was a thing. And I don’t think I am about to start. Ha ha! I do need a life too! I am really leery about doing only a two stage levain. I know I have tried in the past and I just didn’t seem to get the activity that I get with a 3 or 4 stage. I know I should get all the bran in during the first stage but I can’t squeeze it all in with 3 or 4 stages. Since the the first two stages are between 8-12 hours and the last is 4-6 hours, those times equal the soaking time you suggest for the second addition of bran and it is much longer for the first addition. 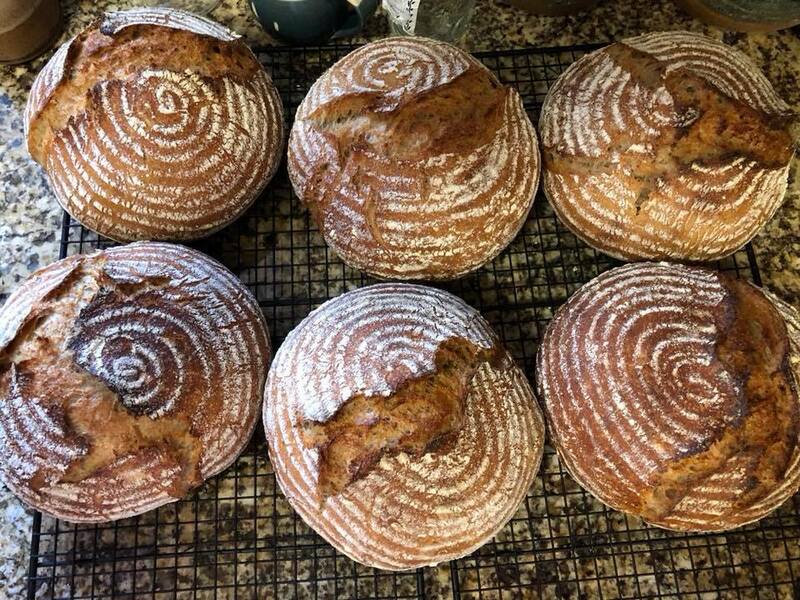 So to be honest, I don’t see the advantage of doing only a 2 stage Levain unless there is extra time in your way of doing things not accounted for, like a trip to the fridge. Is that what you do? As to your last point, using the whole grain flour is the plan for this weekend. I am doing a repeat (with a few methodology changes) of the spiced raisin loaf I did a while ago but subbing some cranberries for part of the raisins. I am still going to need some unbleached flour since I am not putting a ton of whole grain in it. So the plan for this weekend will include milling a tad coarser to get more bran out, and use the whole grain flour to feed Levain at the second and third stages. 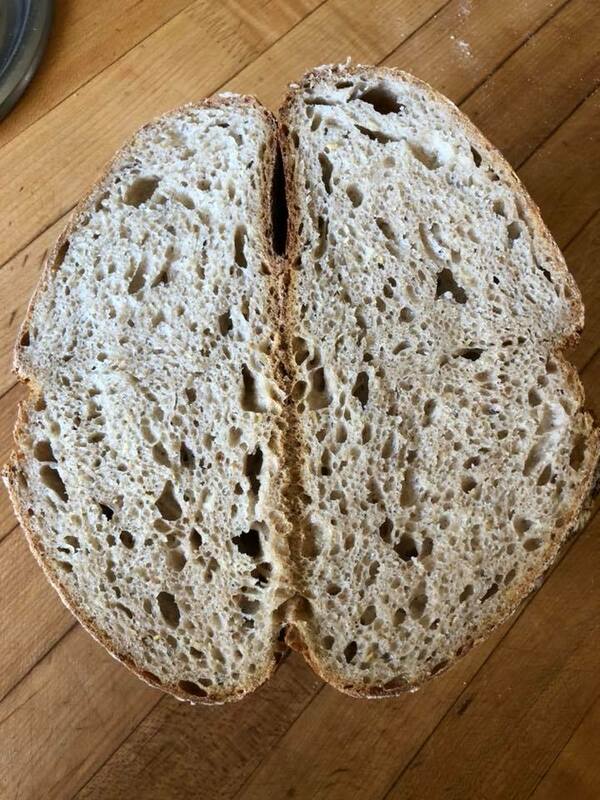 And I am still thinking about that two stage Levain. I have too many people wanting loaves to screw it up. The soup kitchen is getting frozen bread next week because so many want loaves of this Spiced Raisin Cranberry. Thanks for all the suggestions, Dab! Danni, everytime I read one of your recipes, I feel like such a newbie! Don’t know where you get your energy, imagination, and just plain fantastic recipes! Between you and DAB, it’s a constant lesson in baking. Thank you! Compared to most of the other bakers on here! I started this artisan thing just over two years ago. I just have this habit of getting into a hobby and it becomes a bit of an obsession. And we are both very fortunate to have found a fantastic group of people who are willing to share their secrets! Ha ha! I'm new to the site. So glad I stumbled across it reading reviews on a product. I am trying to learn how to make artisan breads. I am going to attempt your recipe. hello, nice loaves, just one question , where do you buy your dutchovens from ? in the USA. I believe they were $29 US each which is an incredible deal compared to the ones here in Canada. Oh and they are 3 quart/litre size which is perfect for 750 to 900 g of raw dough. I have 6 that fit well in my oven. cast iron ones? If I had to do it over again, I would either get the plain black cast iron or get graniteware pots like Trailrunner uses. Those are super light and heat up super fast. Youll have to see it in person though to make sure it isn’t too narrow. Trailrunner uses a huge roasting pan and puts two loaves in at once. Thanks will look into it .Does that material give. A good crust also? with what it produces and another very skeptical Fresh Lofian tried it and was impressed. I do my batards in a graniteware roasting pan and I can’t tell the difference from enameled cast iron. It is a fermented milk drink. You can substitute plain whole milk yogurt which I often use. I just happened to have Kefir on hand that day. Are you able to get all 6 dutch ovens in your oven at once? LazyLoafer manages to get 8 in her oven. I had to jury rig things a bit to get them in there. The lowest rack is resting on the curve at the bottom of the oven rather than on the lugs so it is about an inch from the floor. I have an underfloor element in that oven. So 3 fit on the middle rack and 3 on the bottom rack. I switch them top to bottom and vice versa when I remove the lids. This prevents burnt bottoms as well as the practice of dropping the temperature during the bake to limit the frequency of the elements coming on. LazyLoafer came up with that procedure and it works well. One more thing, be aware of hot spots in your oven. I have one on the right front corner so I keep my pots away from there.